Frankfurt Airport in 1988 was the busiest air hub in Europe, serving many thousands of flights a day between Europe, the near east, nort Africa, and North America. The baggage handling system in 1988 was both state of the art and sloppy. Its workings can be understood as broken down to two parts, loosely termed outer and inner. The outer portion was where luggage arrived at and left from the airport - a zone of tarmac and taxiing aircraft, wagons and luggage containers. From the planes, luggage was carted to a coding station, where items were placed on bar-code numbered trays (containers), one item per tray, and fed into the inner portion. Hard paperwork was apparently normally kept for transactions between aircraft and coding stations, both inclusive. The Zeist Court explained “baggage for most airlines was handled by the airport authority, but PanAm had their own security and baggage handling staff.” Thus the airport and the airline each would then have responsibility for keeping track of their own efforts, and both should be called on in the investigation. The Frankfurt Airport Group would be in charge of unloading KM180, and Pan Am's people would handle loading and screening of luggage coming onto the outbound feeder flight. The inner portion then is what the Court described as “a computer controlled automated baggage handling system” running beneath the airport. This vast electro-mechanic system automatically routed coded items along roller conveyors and through switching stations, at key spots scanned and logged. This system connected coding stations to the various stores, where luggage circulated until needed, and apparently up to loading gates. After this, they re-emerged topside and then to the connecting aircraft’s hold, where again, a record would be kept of loading procedures. The relevant central computer data was produced, if under questionable circumstances, showing one particular item was coded at 13:07 into container no. 8849. It was then routed down to store for two hours until moved at 15:17 to gate B044, from which 103A loaded before its 16:53 departure. No passenger transferred from the air Malta flight to the PanAm one, so the bag thus illustrated was of the dreaded “unaccompanied” variety. 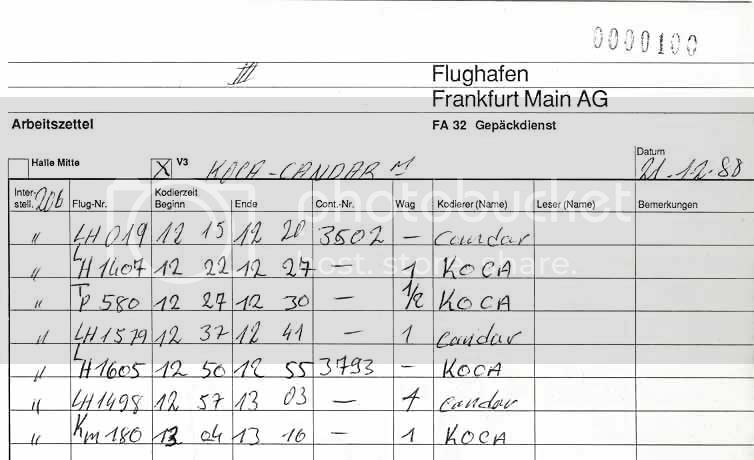 Production 1068: The Opinion of the Court's paragraph 29 denotes this for “the evidence of Joachim Koscha, who was one of the managers of the baggage system at Frankfurt in 1988” It was his evidence that established KM180’s arrival and unloading time, 12:48-13:00. They do also cite a “record,” but provided no direct citation. It isn’t entirely clear if paperwork normally was kept for this – it might have been a policy to determine the number of bags from the computer system, which could count the number of items coded at a certain station and time and take that as the number from the flight coded then. It would be a grossly imperfect system, considering the reliability of this method, as mentioned above. But it would line up with the known laxness of procedure there, and mean one less suspiciously missing record. Production 1092: This is an “interline writer’s sheet” filled out by Andreas Schreiner, who was in charge of monitoring the arrival of baggage at V3 That bears to record one wagon of baggage from KM180 arriving at V3 at 13:01.Within V3 are seven coding stations, where luggage is placed into bar-code numbered trays to enter bottomside. They cite the sheet’s contents in table form and it seems like they had these records at hand. No number of bags in that wagon is given. This brings us to the reliability of coding station logs in determining where a particular item really came from. The Zeist judges heard testimony that “luggage was always delivered from one flight only” at any given time." [Opinion of the Court, para 29] Taking this literally would mean a station's log saying flight X was handled from 1:00-1:05 means an item shown in the computer system as coded there at 1:01 is clearly from flight X. But this is not completely sound. Dennis Phipps noted the unreliability of these logs in the Maltese Double Cross, and it's been widely noted that lapses of stray bags being inserted during another flight's coding are not only possible but recorded, and common sense itself suggests such a presumption is, at the least, not guaranteed to be right. The degree of correlation between coding time and flight number is certainly higher than zero and less than 100%, and debatable from there. A separate post, Coding Station Reliability, will address this controversy, but generally below it should remain an open question. Production 1061: This document (above) was identified by witnesses Mr Schreiner and Mr Koscha “as a work sheet completed by a coder to record baggage with which he dealt.” The name of the coder in question was Koca, who was not called as a witness.” Pity, since the document shows us little detail. The signatures alternate Koca and Candar, listing either container numbers or numbers of wagons of luggage, the flight number it’s from, time they started coding, and stop time. The relevant line is the last one – one wagon of luggage from KM180 started coding at 13:04, and ended at a time disputed as 13:10 or 13:16. (13:10 yields a time closer to those previously noted, and it's what the Court decided. The difference is six minutes of time, which could have increased the likelihood of a stray bag being introduced. Again, refer to the post on coding station reliability. Production 1060 (at left - r-click/new window for readable view) This is the famous computer printout, the single document that allows “the inference," drawn by the Scottish Judges, "that an item which came in on KM180 was transferred to and left on PA103A.” It's a list of items routed to PA103A, taken by airport employee Bogomira Erac for personal reasons and handed over to investigators only a month after the disaster. It was the first time they'd seen it. What's highly unusual about this evidence is that the German federal police (BKA) were unable to secure their own copy, right off the computer, in the days after the crash. In the end, we had to rely on a memento copy from someone’s locker, which existed only by sheer luck. It was that close to having a whole airport's luggage records go completely missing, right after such a massive event demanded that information. The troubling case of the missing records is worthy of a detailed stand-alone post. Another interesting question is why the BKA then made the official investigators in Scotland and Washington wait another six months before sharing it with them. It wasn't until mid-August 1989 that Scottish police were able to see this pivotal record that wound up turning the investigation around to Malta and thence Libya. Whatever the book got wrong, Trail of the Octopus is helpful on this issue. Mrs. Erac' testimony at Camp Zeist in 2000 clarified that the printout was not taken to the BKA until approximately the last week of January, so a 1 February foray is a perfect match for being spurred by the printout. Any records of any earlier efforts, fruitful or not, remain under wraps. Upon getting the papers in August, Orr and his men quickly investigated the airport themselves, and also got more serious about previous clues leading to Malta. What the printout shows, briefly, is 111 items listed numerically by container number. The relevant portions are highlighted in the condensed version below. PA103A is referred to herein as F1042. The relevant item 8849 was coded at station S0009, which it’s been determined means station 206, at 1307. That is a fit with KM180’s load. It then goes to Gate B044 at 1523, the same few-minute span most of 103's luggage arrived. What happened from there is outside the computerized system and not recorded here. But according to this, two late-coded items were sent to a separate gate B041, and curiously, these two items bracket the apparent bomb bag, numerically speaking, and so are visible below. All 108 items not shown here were sent to gate 44. - If it could be certain that station 209 at 1307 means KM180 and nothing else, this would be solid evidence of a bag from that flight. - It could have been an item of another origin passing through there at just the right time to appear as from KM180. This does require a certain acceptance of coincidence, but cannot be ignored. - The data could clearly mean to say KM180, but itself be fraudulent. This would explain the printout's appearance and the primary data's disappearance. Perhaps the two were not really unrelated bad and good luck, but two halves of a bait-and-switch routine, perhaps carried out by the BKA for uncertain reasons. Production Null: The normal, official, system-wide, right from the computer luggage records. As has been mentioned, for some reason the primary data of luggage movements was lost, but avoided making a big noise once a copy was luckily found. So it was no loss, we might presume. But how would we know? There may never be answers to the riddle of the lost computer data, but a dedicated post is warranted to explore what we do and don't know about it. Production Null: PanAm’s loading records for flight 103A. [Coleman/Goddard] TRAIL OF THE OCTOPUS -- FROM BEIRUT TO LOCKERBIE -- INSIDE THE DIA. Chapter 7. Online posting. Perhaps the German police didn't think much of the printout because it's not really helpful. My head spins a little trying to work out why it's been decided by the prosecution that this tells us anything helpful. I do get it, but they're really clutching at straws. but not the date that the file is printed. It's a shocker that this is the only evidence presented as proving a bomb came through Frankfurt airport from Malta on it's way to London. Bogomira's evidence says she printed the thing out in the evening of 22nd December. Presumably between 7.32 and 7.36. A printout that long would probably take about four minutes. I'd like to know what the TO and BP codes mean. I understand the rest of it. This is an old post I need to update a bit. Thanks for the reminder, al aplage. For a while I thought it wouldn't have a time of printing but no date, so the Datei von was the same as day printed, meaning this was likely an auto copy (or made to look like one) from 881221 itself. But that makes little sense. Indeed. It isn't even vouched for until 8 months after the fact. The silence in the interim was deafening but little noticed (almost as shocking).